Amerec steam rooms are a wet heat alternative to more traditional dry saunas and come in a wide range of sizes and styles. Amerec manufactures components, including steam generators that can be used to transform your standard shower into a fully functioning steam room. They also manufacture commercial steam generators used in spas, health clubs, hotels and other facilities where powerful generators are needed for steam rooms that see long term, daily use. If you have the space and are interested in a larger, dedicated steam room for your home, they also offer custom installed rooms. Amerec products are unique in that they can be used to add steam producing capability to homes where most people wouldn't think there is sufficient room. They've been manufacturing steam bath generators and other components since 1979 and enjoy a solid reputation. Steam rooms are not the same as saunas. Saunas provide dry heat that is occasionally interrupted by the addition of water poured over the sauna rocks, but the humidity is actually quite low. In Amerec steam rooms, however, the humidity is close to 100%; the temperature in steam rooms is lower as well, hovering around the 125°F mark. This provides what is often referred to as "soft steam," which some people find more comfortable than the higher temperatures found in saunas. Because Amerec has been producing commercial grade generators for over thirty years, they have a reputation for manufacturing top quality equipment. Their innovative designs ensure an even flow of steam with very little variation in temperature, a problem some steam rooms have if the ceilings are higher than seven feet. 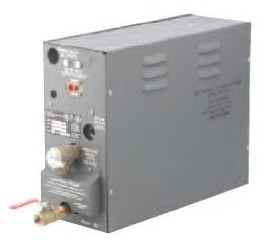 The Amerec Vapormist 120V steam generator is one of their most popular in-home generators, as the generator itself is compact and can easily be stored in a closet, on a shelf, or even beneath the steam room's seat for easy access in the event repairs are needed. Check Out Amerec Steam Generators On Sale Now! The advantages of a steam room are similar to those of using a sauna. The wet heat promotes clearer, softer skin and helps flush toxins out of the body by encouraging a healthy sweat. Many people also find that using Amerec steam rooms improves blood circulation and can help alleviate cold symptoms by clearing the sinuses. Both steam rooms and saunas are luxury upgrades that are becoming increasingly popular with homeowners. 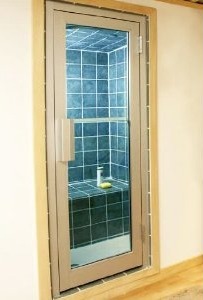 Amerec steam showers can be purchased as complete units, including the surrounding walls, or you can order the components to turn your current shower or any small room into an oasis of relaxation. If you go the latter route, you'll need to make sure the shower area is completely enclosed with waterproof flooring and walls. Granite, travertine and ceramic tile are all good choices to use with an Amerec steam generator. Amerec steam rooms are some of the most popular in North America because of the company's outstanding customer service and support. They provide their customers with extensive documentation, clear instructions for installation, and excellent customer support online. If you're interested in a steam room rather than a sauna in your home, Amerec offers true flexibility and exceptional design options.